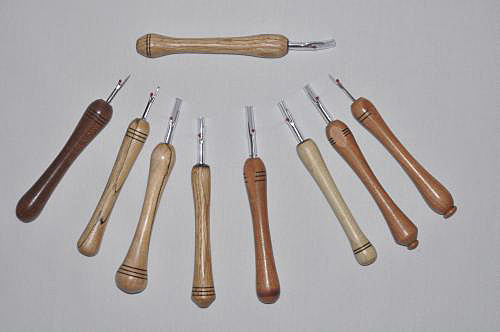 Many of the seam rippers that are presently in the market are small, uncomfortable to hold, plastic and cheaply made. The No-Roll Seam Ripper is made to fit your hand comfortably, hand-crafted from wood and elegant in appearance. One of the unique aspects of these rippers is that they have an ergonomically-designed "thumb flat" on each side of the handle so that when you pick it up it is in the right position to rip. It also allows either right handed or left handed use. Since the handle is made from wood it is very comfortable in your hand. No-Roll Seam Rippers are made from your choice of Pennsylvania Black Cherry or Red Oak. They are approximately 5 ¼" long by ¾" thick at the big end. They will be another heirloom that you will pass on to your grandchildren and your grandchildren will pass on to theirs! When you purchase a No-Roll Seam Ripper, it comes with a reconditioning service. The service costs $10 per seam ripper each time you use the service. The reconditioning includes replacing the metal tip and redoing the wood surfaces. This is an excellent offer and will allow you to always have a sharp, quality seam ripper. Contact me if you need to take advantage of this service and I'll tell you how to get it done.